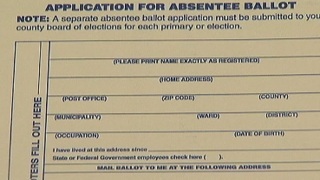 Deadline Nears to Request Absentee Ballot by Mail in Va.
Virginia residents who want to receive an absentee ballot by mail for the upcoming election better act quickly. Voters have until Tuesday at 5 p.m. to submit a request to their local registration office to receive an absentee ballot by mail for the Nov. 3 election. Virginians can submit their requests online or by mail, email or fax. Residents can vote by absentee ballot for a variety of reasons, like a disability or illness or out-of-state obligation. Absentee ballots must be returned in the mail by Nov. 3 at 7 p.m. Residents can vote absentee in-person until Saturday.